Haven’t you watched a Star Wars movie and wondered about where some of the Jedi Insights come from in real life? When you listened to Yoda, haven’t you wondered about the actual benefits of meditation? When you saw Mace Windu fight with a lightsaber, have you wondered how real swordplay can affect your life? When you heard Obi-wan Kenobi mentor Luke Skywalker on both, didn’t you wonder about the connections between the Jedi path and real world wisdom? 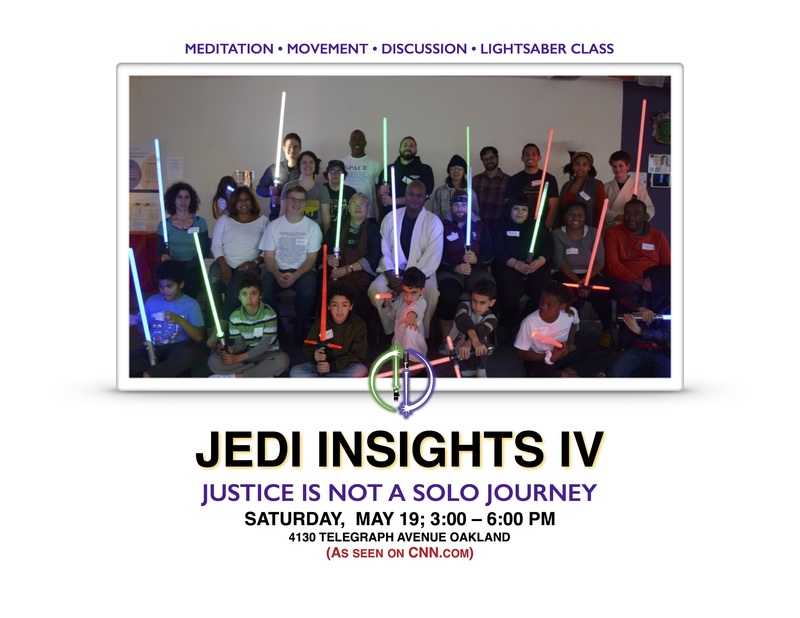 Join fun and informative conversations (one or two hours) that explore how Jedi Insights on life from the Star Wars movies reflect the teachings of real meditation, martial arts and spiritual masters, particularly Takuan Soho (a 16th century Buddhist monk) and Miyamoto Musashi (a 16th century samurai). We also explore how Joseph Campbell has mapped out the heros’ journey across time and many cultures and how it applies to our lives. Guided meditation and gentle movement suitable for all levels, abilities and bodies will supplement the experience. If you like, do bring your (toy) lightsaber. Sith, bounty hunters and Storm Troopers looking to turn away from the Empire and join the Rebellion are welcome. Teachers have professional experiences that can relate mythology to everyday life. Study the examples of Jedi Insights provided on this site. Train by attending a Jedi Insights conversation. Each teacher has an affinity for the Star Wars movies and can interweave their favorite scenes with the particular teachings they have studied. Communicate with Jedi Insights: A Force for Peace, Liberation & Enlightenment, a project of Ananda Martial Arts & Fitness Academy. Schedule a session for your organization by contacting Master Ellis at jediinsights@gmail.com. Jedi Insights Episode I: “The Rebel Life” featuring Dr. Mushim Ikeda and Master Ellis on January 10 at the East Bay Meditation Center in Oakland. Several Jedi, padawans and even Chewwie joined the conversation. "I've got a good feeling about this!"